Years before Monty Python, a red-nosed comedian in disreputable tails and an improbable moustache created a world all his own. 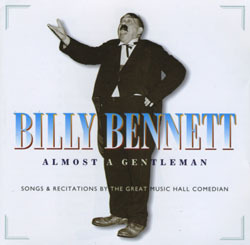 With his spoofs of well-loved poems, raucous street-corner singing and surreal narratives of life in the saveloy-and-gin class, Billy Bennett brought a spirit of daring and rebellion to English music hall and variety stages in the 1920s and ’30s. Billy Bennett can now be seen as a street-wise surrealist and his remarkable humour shines as bright today as it did then. The CD is remastered to the highest standard from the best condition original 78-rpm discs.